When you’re a college student, it can be tough to make money because you’re limited on time. You already have classes to take, papers to write, and maybe even a work-study job to help you pay off loans. Fortunately, there’s a way that college students can make some extra money by doing something they have to do every day anyway: take notes! 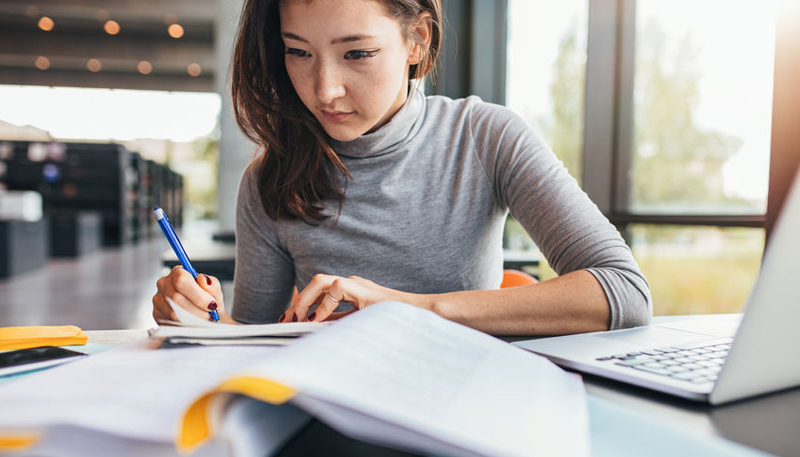 If you’re an exceptional note taker, then it’s totally possible for you to make money to sell study guides and thorough notes to other students who need some help. I was a college student once, so I know the struggle that students face when trying to pay their way through college but not having a lot of money-making options available. That’s why I put together this roundup of websites that let you sell your college notes and make a little extra money between classes. Sell College Notes Online for Cash! I do want to start off by saying that you won’t get rich selling your notes. However, remember that taking notes is something you’re doing anyway, every single day. There are no extra steps to take or extra time taken from your day when you sell your notes. You’ll already have them, have used them, and can now pass them along to someone else who needs more. And you’ll earn some extra money from doing it. So, while you shouldn’t expect to earn enough income to replace a job, you can expect to earn some extra cash to help you out through college. Campus Shift is a marketplace for notes where you can find other students who want to buy yours. You’ll get 85% commission on the notes you sell and can set your prices. Campus Shift also lets you sell used textbooks, so you won’t have to search for another site to use to make money off those too. Course Hero is a place where you can sell notes, study guides, and other helpful resources to other students. This site also has tutoring, 24/7 questions and answers, and other helpful resources for any struggling college student. If you’re an awesome note taker or write a lot of in-depth study guides for classes, then you can definitely benefit from selling your stuff on this site. Course Hero used to offer cash to people who uploaded their resources for others. Now, the only way you can earn money is by becoming a tutor. However, you can earn money toward a monthly subscription to the site by uploading documents and by referring friends, which can save you money while you get some excellent study help for school. Nexus Notes is a marketplace for notes and helpful resources for students. When you upload your notes and study guides here, Nexus Notes actually checks them for accuracy and helpfulness before they’re added to the database. Once approved, others can purchase your notes for $35. You’ll receive 50% commission for every set that sells! Nexus Notes will pay you your commission at the beginning of each month via PayPal. Notesale is a place for UK students to go to buy and sell college notes. Here, you can set your own prices for your work. It’s a good idea to be somewhat competitive in your pricing, though, or you may not get many bites from broke college kids! You can upload your notes quickly and they’ll automatically be available for download and purchase by other students. It’s not clear how Notesale pays or what your commission price will be, but you can always contact the company via the website to ask further questions before you start selling. Notesgen actually focuses on more things than just notes. Think of it like a one-stop shop for any type of valuable educational material that can help college students. You’ll set your own prices here and can get paid every Friday for your sales. You’ll get 60% commissions for sales. Notesgen also has an app for Android and iOS devices that lets you access your account and upload notes quickly and easily. Notesmate is another website that lets you find buyers for your college notes. There’s also an app available for iOS and Android devices. You can set your own prices for your notes, or even give them away for free if you feel like being generous. This place is somewhat like a social media network too. Others can follow you, which can help you get more eyes on your notes. You can get your payments transferred directly to your bank account, although the website doesn’t mention specifics on how often you’re paid or your commission. This site is for Australian students who want to earn some money from their notes. It’s free to use the marketplace and set up a shop for your notes. You can even set your own prices. The best part is that you’ll earn 100% of your sales through NoteXchange! The only trick is that you can only earn 100% commission if your buyer purchases notes through your own marketing tactics. If NoteXchange helps someone see and buy your notes, then you’ll earn 50% commission, which is still a great number. You’ll receive payments once at the end of each month via your bank account. Omega Notes lets you sell a variety of helpful resources, including cheat sheets and study guides, for other students. You can price all your downloads yourself, but Omega Notes does offer a helpful recommended pricing guide to get you started. The recommended prices are based on what students tend to actually pay for those types of resources. Omega Notes offers 70% commission. There are some other fees to note though. You’ll get charged certain fees for pricing something above $35, as well as listing something for 24 months or more. Large uploads may also be subject to a fee. The best thing about this site is that you won’t have to wait to get paid. Omega Notes sends you your money via PayPal for your notes immediately after someone purchases them. OneClass works a little differently than the others. You won’t get cash for your sold documents but will instead earn credits. You’ll earn credits for uploading your helpful notes for others to download. If you have excellent note-taking skills, you can become an Elite Note Taker, which gives you three times as many credits per upload. You can exchange your credits for cash and prizes, like Amazon Gift Cards. If you know friends who could use some extra study help, refer them! You’ll earn 50 credits for each friend who signs up under you. Oxbridge Notes is among the most popular note-selling websites. It covers students in several countries, including the United States, Canada, and the United Kingdom. You can sell a variety of materials here in addition to notes, like outlines, PDFs, sample test questions and answers, and more. You’ll receive 72% of the net sales price that Oxbridge Notes receives after PayPal fees and sales tax are taken out. The website states that the average seller makes about $250 a year selling their materials, which is $250 extra in your pocket that you didn’t have before. Quest Notes is a simple marketplace for students to buy and sell notes. Upload your notes and Quest Notes handles the rest. You can have multiple sales on one set of notes. The only downside is that you can only earn up to $0.20 per upload. However, you’ll also get free credits that you can use toward other notes that you might need, which can save you money. You get 70% commissions on your sales and you can withdraw your money once you have at least $10 via PayPal. You’ll need to send in an application to become a notetaker for Student Notes. This site focuses on in-depth notes to help others study for tests in specific classes. You can earn cash for the notes you take for every test in your class. The amount you make will vary depending on how well you took notes and how many pages they are. The website states that, on average, a set of notes sells for $75. You’ll get 5% of the sale. You’ll need a GPA of at least 3.4 to be eligible to become a notetaker for Student Notes. StudentVIP is a large Australia-based marketplace for student resources. You’ll get 75% commission on your notes and are allowed to price them up to $59. StudentVIP will review all materials you upload before they’re eligible to be sold on the site. So make sure they’re great! You can request a transfer to your bank account and can expect to see it within 14 days. You can apply to become an Elite Notetaker with StudySoup. You can choose to cash out your earnings via PayPal or direct deposit. Either option should give your money in 2 to 5 business days. The site does cap sellers on selling only three study guides per semester. Stuvia is another place to go to get paid for your notes. This site accepts study guides, outlines, flashcards, and more. You’ll need a minimum of 10 euros in your account to cash out. When you do choose to withdraw your money, Stuvia will pay it out the following Monday, every week. You can set your prices for your notes and Stuvia will take a commission, although I can’t find an exact amount on the website. You’re a struggling college student who needs some extra cash to buy food, textbooks, and all the other essentials. I’ve been there, and I made it through. Although I’ve never tried selling my notes (only because I wasn’t aware that it was possible at the time! ), I found other ways to make some cash through college. Selling notes seems much easier than some of the other methods out there! After all, you take notes every single day. You usually don’t need them after you’re done with the class. So why not sell them and make some money while you help out other students? Have you ever sold your college notes? If so, have you used any of the above sites or know of others that let you make some money in similar ways? Can we sell the same note to these different sites? Or do they not accept duplicates.